American Welding Society guest speaker:William Hagy - Lampwork Etc. I had been contacted by a member of the AWS to lecture during one of their meetings coming up on Feb 20th at 6pm. 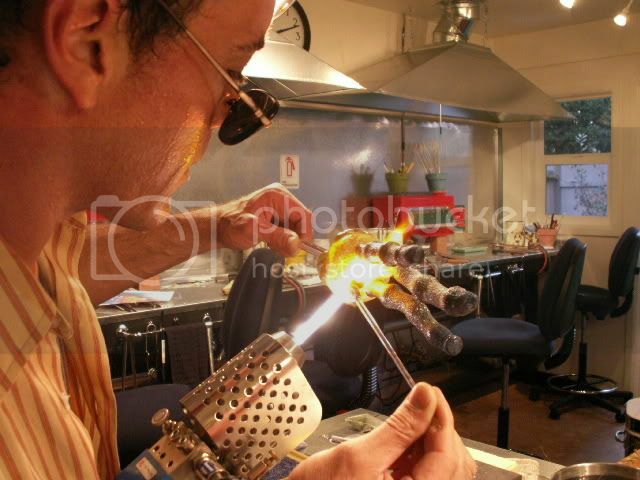 I was contacted to present the members of what lampworking entails,the various levels of the artistic medium, ventilation, fuel & oxygen supply, as well as the different types of bench burners available for use and how they differ from the average welding equipment. 50mm & 40mm Herbert Arnold Zenit Burners,Carlisle cc/cc+/mini,Liquid O2. I would like to start as a small hobbyist. All I do now is read, roam around places which also acts as a sort of exercise and I sometimes watch some TV. This comprises my leisure time. I had recently completed a tool and die course from a A.W.S affiliated center. Would the course I attended be enough for me to start trying with lamp works? The tool and die welding program even included topic sections on proper procedures for Oxy-Fuel, Plasma, and Carbon Arc Gouging and cutting equipment. Health and Safety for arc welding and cutting and Metallurgy. Looking forward for a suggestion from your end. My friend was hurt, when he tried something of the like without proper follow-up. I don't want to end up in such accidents, even small. Looking forward for the minutes prepared for your session, to understand the art and procedure more. Last edited by Micha; 2018-01-05 at 12:12am. All times are GMT -7. The time now is 3:01am.